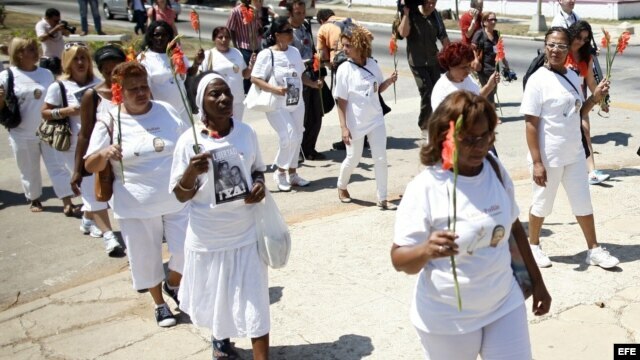 A number of Ladies in White were violently attacked and arrested by agents of the Cuban dictatorship this Sunday, April 28th, as they tried to assist Mass to pray for the freedom of Cuba. One of the women who suffered the worst beatings was Belkis Cantillo Ramírez, representative of the group for the province of Santiago de Cuba who recently returned to Cuba after traveling to Brussels to receive the Sajarov Award alongside Laura Labrada Pollan and Berta Soler. Cantillo’s arrest took place when a group of these women were on their way to the Rosario Church of Palma Soriano. The activist told ‘Diario de Cuba’ that various men, agents of the political police, were the ones who carried out the beating against her, even punching and attacking the women with umbrellas. “They punched me in one of my breasts, they kicked my ribs”, Belkis told the digital newspaper. Other detainees were Taimi Vega Biscet, Yaima Naranjo, Mariela Rodríguez, Niurka Carmona, Denia Fernández, Madelaine Santos, Yasnay Ferrer and Yanela Ferrer, according to ex prisoner and dissident José Daniel Ferrer García who published the information on his Twitter account (@jdanielferrer). Another 30 women managed to make it inside the church, but the political police organized an act of repudiation which consisted in shouts of death threats, racial slurs and other offensive phrases, according to Aime Garces, one of the Ladies inside. She explained to this blog that despite the repression “the Ladies in White will continue firm and without fear”. In the same channel there are also videos of interviews with some of the detained Ladies in White, here and here. In other parts of the island, Ladies in White marched and assisted Mass, as was the case in the province of Matanzas and in Havana. Dissident leader and former political prisoner of conscience Angel Moya Acosta published various photos of these women marching in Havana on his Twitter account (@jangelmoya). Moya recounts that 44 Ladies marched in the capital, demanding the release of Sonia Garro Alfonso (one of their members, jailed for more than a year) and her husband Ramon Alejandro Munoz. They were accompanied by more than 40 men, human rights activists. Meanwhile in Miami, the representative of the Ladies in White, Berta Soler, participated in an emotional and very symbolic Mass at the Ermita Shrine, along with exiled Ladies in White and former political prisoners, as well as many members of Miami’s exile community. The Mass, hosted by Father Rumin, was dedicated to the fallen Laura Pollan and all martyrs of the Cuban dictatorship. There was a moment of prayer for the Ladies who were violently arrested that morning in Cuba, simply for trying to do what so many people were doing on that afternoon in Miami. Soler was handed a Cuban flag with the image of the Virgin of Chartiy, while she presented a Cuban flag at the altar. A moving surprise came when Cuban musician Amaury Gutierrez showed up to sing “Laura“, a song written by Luis Piloto and dedicated to Laura Pollan. In Cuba, the Ladies in White sing this song each Sunday after carrying out their Sunday marches. Soler has been received with much affection by the Cuban exile, while she has been seeking more international support for the internal opposition. Through an excessive amount of violence, the dictatorship has sent a clear message to Berta Soler and other activists who have traveled outside the country to let the world know about the Cuban reality, as was the case of the repression against Belkis Cantillo, just days after having returned from her trip abroad. However, the Ladies in White are also sending out a clear message to that same dictatorship: they do not fear them, they will continue out on the streets and they will not rest until Cuba is free.